The true power of any smartphone can only be unleashed when it is connected to the internet. But when you don’t an active Wi-Fi connection (and your phone doesn’t have a data plan) then you have to enable the Wi-Fi hotspot in one of your phones. While this is not very tedious, it does take a few seconds to setup the Wi-Fi hotspot. If all goes well, then ‘Instant Tethering’ would automate this process in future. Currently, ‘Instant Tethering’ is being rolled out to select Android devices bundled with Google Play Services 10.2 update. The feature works by detecting whether all your devices are online or not. If one of your devices loses internet access, then it automatically enables the hotspot in the other device that has access to mobile data. The only trick here is that all your devices must be logged in via the same Google account to detect if the internet connection is dropped in any of the associated devices. The process uses Bluetooth for negotiating the connection and requires no human interference. When the request for Wi-Fi hotspot is processed, then you would be shown the battery level of your Wi-Fi host, warnings related to cellular data usage, battery drain, and disconnection from the Wi-Fi network. Before you get super excited about this new Android feature, please be informed that this is feature is currently being tested on select few devices. 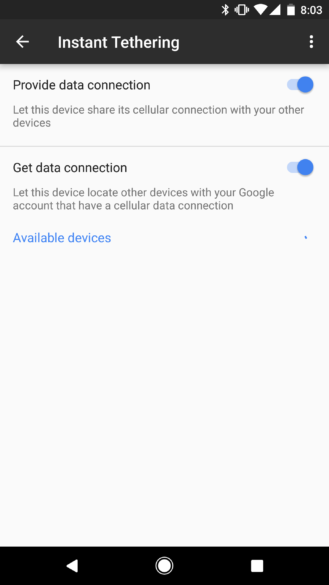 If your devices are running Google Play Services 10.2 (even on Marshmallow) then you can check if your device supports ‘Instant Tethering’ by checking for it in the ‘Google’ menu in the main system settings. The list of supported devices, for now, includes Google Pixel, Google Pixel XL, Nexus 9, and Pixel C.
Instant Tethering is currently available on Nexus and Pixel devices running Android Nougat 7.1.1. However, it should be noted that Nexus 9 and Pixel C can act only as clients, that is they will only be able to connect to hotspots created by other devices, and not vice-versa. On the other hand, phones like Pixel and Pixel XL can work both ways. They can create hotspots for other devices and can request Wi-Fi hotspot from each other too. 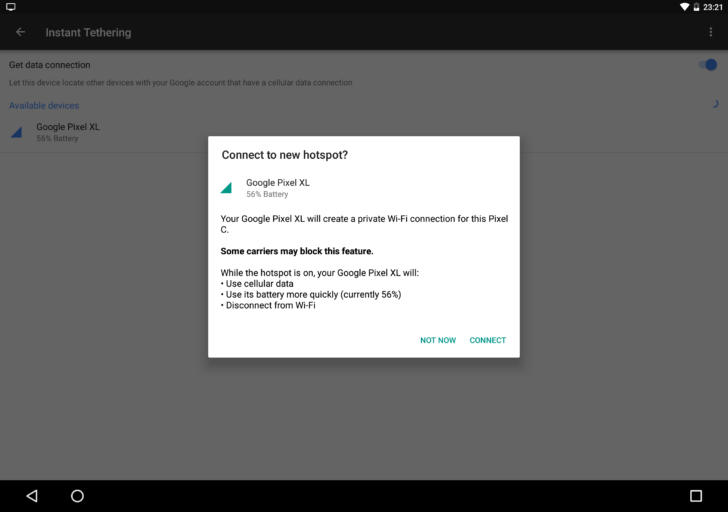 For now, tablets like Pixel C and Nexus 9 cannot create Wi-Fi hotspots via Instant Tethering, but I will not be surprised if Google enables the Android tablets to work as clients and hosts both. More and more tablets are being launched these days with 4G LTE support and given the fact that tablet computers usually have a large battery, it would make perfect sense to use them as a portable hotspot device. If you own any of the above-mentioned devices then do check ‘Google Settings’ to see if ‘Instant Tethering’ is supported or not. In case it does, then try it and let us know how it worked for you. Google Chrome for Android Now Supports Bluetooth Enabled Beacons!